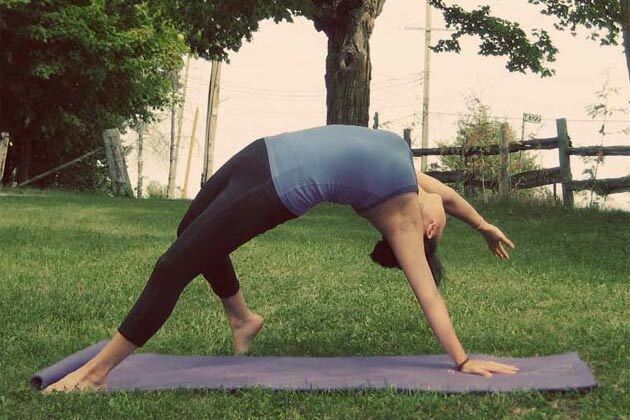 Do you love Wheel Pose as much as we do? If so, then you're always looking for fun, new ways to get into the pose. As always, when it comes to deep backbends, make sure that you're properly warmed up first. A few rounds of Sphinx Pose, Cobra Pose, and Locust Pose should do the trick. This sequence should come towards the end of a full yoga practice, to ensure that your whole body is ready for the challenge of Wheel Pose. Begin with Threading the Needle for 5 breaths on each side to stretch out your shoulders and gently twist your spine. Next, stretch out in a wide knee Child's Pose with your palms together behind your head, and your elbows pushing down into the mat. Gradually walk your elbows forward and press your chest down. This variation opens your shoulders, so hold it for a good while. Oscillate your spine in preparation by taking five rounds of Cat/Cow, gradually going deeper with each breath. In Cat Pose, bring one knee at a time to meet your nose and hold for five breaths, squeezing your belly in and rounding your back to ignite your core. Make sure you are pressing the floor away with your hands. Extend out to Plank and practice rocking backwards and forwards to open your wrists and warm up your shoulders. Take one Vinyasa and land in Downward Facing Dog with one leg in the air. Flex your lifted foot, bend your lifted knee, and stack your hips open (sometimes referred to as “Scorpion Dog” or “Stacked One-Legged Dog”). Do this on both sides. Step both feet forward for Chair Pose and hold for 3 breaths, sitting deeper with every exhale and pulling your abdomen in. Stretch your spine and legs out with a Standing Backbend and Forward Fold to Rag Doll. Come to kneeling for a gentle Half Camel Pose with one hand on your heel and the other extending up to the sky and then back. Keep your hips pushing forward and chest pressing up. Switch sides. Make your way back to seated, and twist to the left, then to the right with hands at heart center. Tuck your toes and move forward to Plank. Hold for five breaths to reignite your core then take Stacked One Legged Dog again. Start to “flip your dog” by letting the lifted leg weight you over to that side. Root both feet into the mat and keep both knees bent as you lift your hips. Allow your arm to fall back towards your ear and drop the weight of your head. Maybe one day you reach down and tap the mat or push into Full Wheel… maybe. Hold for five breaths. Re-flip back to Downward Facing Dog, take one Vinyasa back to Child's Pose, and lengthen your spine before taking a final Thread the Needle Pose, just as you began your flow. There you have it! 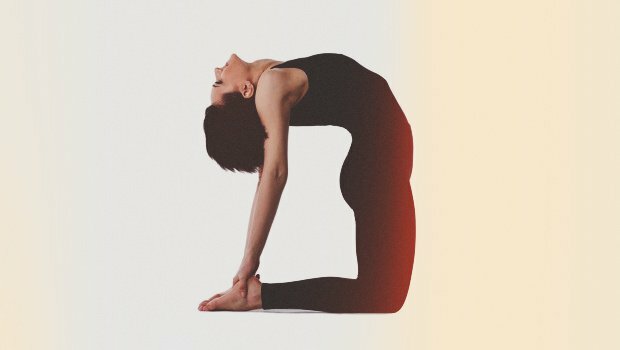 A (slightly) more challenging way to sequence with Wheel Pose as your peak pose. Try it out for yourself, and let us know how it goes in the comments below!